It doesn’t really snow here in Portland. In the 10 or so years that I’ve lived here, it’s only snowed a handful of times. Most of the time I’m pretty happy about this fact (since I'm probably one of the rare folks who absolutely hates snow), but it does sometimes leave me daydreaming about a white Christmas (because it’s a lot easier to appreciate how pretty and picturesque everything is when you don’t have to deal with bad drivers, dirty snow and soggy shoes). This is literally hot chocolate in cake form: chocolate chunks melted in hot cocoa liquid, mixed together with some flour, sugar, oil and eggs to give it structure. The trick for a super chocolatey cake that isn’t too heavy or sickly sweet is to find an instant hot cocoa mix that is primarily cocoa powder, without too much added sugar or sweeteners. If you’re a purist, you can even use regular old boiling water (or even coffee, for you coffee lovers out there) and it’ll be amazing! I promise. 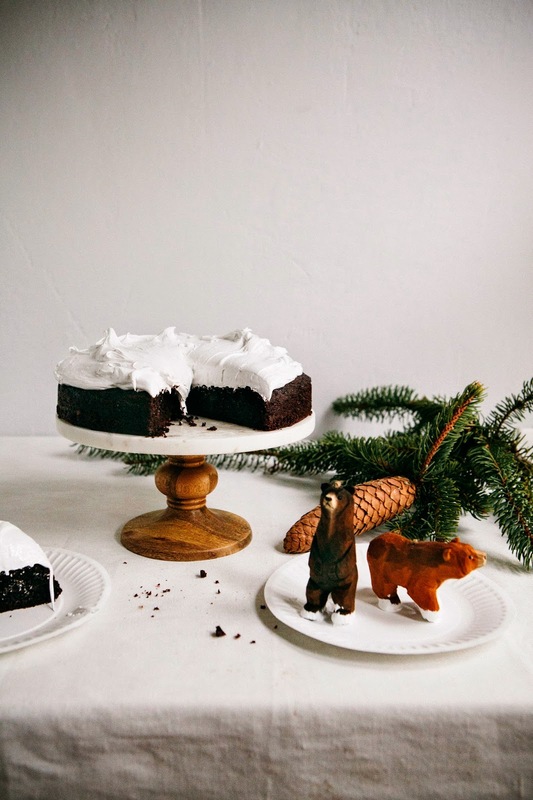 And true to a classic hot cocoa, I’ve topped it off with incredibly fluffy, vegetarian-friendly marshmallow fluff frosting straight from Food52, one of my much trusted recipe sources. The frosting is just egg whites, sugar, and corn syrup, with no gelatin whatsoever. Together, the ingredients whip up to a texture similar to meringue, but fluffier and stickier — the way marshmallow fluff should be. I was tempted to use a chef’s torch to brulee the marshmallow topping on the cake, but I was worried it would ruin my cake’s winter wonderland effect. I mean, the bears are just so damn darling, right? It actually looks like they’re romping around in the snow! Contrary to what my pictures have you believe, this recipe actually yield two 8-inch cakes! I froze the other one for later. But you can stack the two and layer marshmallow fluff in between each layer for a rustic, unfrosted look (which is so popular right now!). The marshmallow fluff recipe makes enough for you to do so. For this recipe, it's important to use natural, unsweetened cocoa powder for the cake batter as opposed to Dutch-processed cocoa. Dutch-processed cocoa has been treated with an alkalizing agent that gives it a prettier color, but also a milder flavor since it takes away some of chocolate's acidity. It's important to use natural cocoa powder in this cake for a deep, dark chocolate flavor. Like I said in my post, it's important to use an instant hot cocoa mix that doesn't have too much added sugar or sweeteners. Epicurious has a great guide comparing instant hot chocolate mixes, as does The Sweet Home and The Daily Meal. You can also make your own (I like this recipe from Craftsy), which would probably best since you can control the amount of sugar that goes in it. Whatever you decide, just make sure that it's mixed thoroughly and boiling when you add it to the chocolate in the recipe. Preheat the oven to 350 (F) and prepare two 8-by-3 inch round cake pans by spraying liberally with cooking spray and lining the bottom of each pan with a parchment paper circle. Spray the parchment circles and set aside. In a medium heatproof bowl, combine 2 ounces coarsely chopped 70% cacao chocolate and 1 cup BOILING hot chocolate drink. Whisk until the chocolate is completely melted, before allowing the mixture to cool for 15 minutes. While the chocolate mixture is cooling, whisk together 1 1/2 cups all-purpose flour, 1 1/4 cups natural unsweetened cocoa powder, 1 1/2 teaspoons baking soda, 3/4 teaspoon kosher salt and 1/2 teaspoon baking powder in a medium bowl. Set aside. In the bowl of a freestanding electric mixer fitted with a whisk attachment, whisk 2 large eggs on high speed until foamy, about 2 minutes. Reduce the speed to the mixer's lowest setting and slowly pour in 1/2 cup vegetable oil. Once all the oil has been poured into the eggs, raise the mixer speed to medium and whisk until fully incorporated, about 1 minute. Reduce the speed back to its lowest setting and slowly pour the slightly cooled chocolate mixture into the egg mixture, before slowly pouring in 1 cup buttermilk and 1 teaspoon vanilla extract. Add 2 1/4 cups granulated sugar and continue whisking on low speed until the batter is smooth and liquid, about 2 minutes. Stop the mixer, and use a rubber spatula to scrape down the sides of the bowl. Replace the whisk attachment with a paddle attachment and turn the mixer back on to its lowest speed. Slowly add the dry ingredients (from the 3rd step) about 1/4 cup at a time. Once the dry ingredients have all been added, turn the mixer to medium and beat for 1 minute, no more! Be careful not to overmix — if there are one or two flour streaks or lumps left, you can finish mixing the batter by hand with a rubber spatula. This is a pretty lumpy batter, so don't worry if there are still lumps here and there. Divide the batter evenly between the prepared pans. 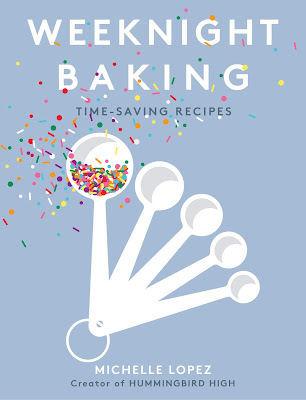 Bake in the preheated oven for 40 to 45 minutes, or until the tops spring back when lightly pressed and a skewer inserted into the center of each cake comes out clean. Transfer to wire racks and let cool in the pans for about 20 minutes. 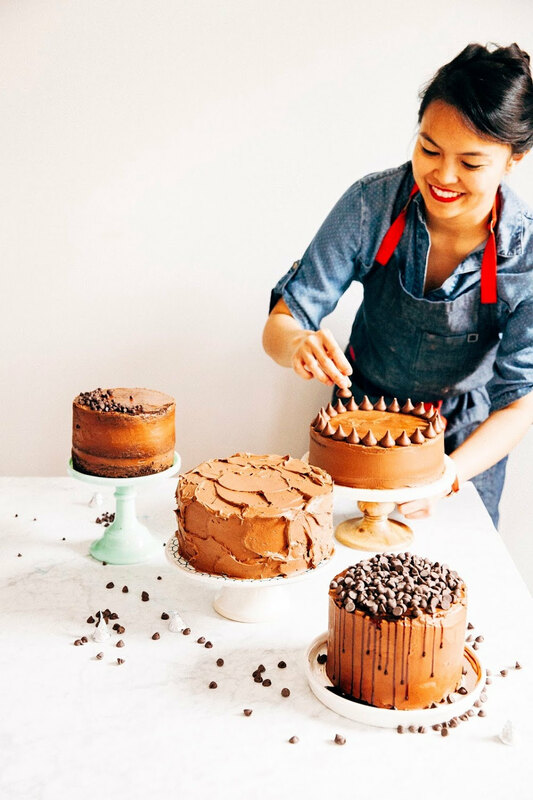 When the cakes are cool enough to handle but the pans are still a little warm, run an offset spatula around the edge of each cake and invert onto the racks to cool completely before frosting. In a medium saucepot over medium-high heat, combine 3/4 cup granulated sugar, 3/4 cup light corn syrup, 1/4 cup water and 1/8 teaspoon kosher salt. Bring the mixture to a boil, stirring often until it reaches 240 (F) on a candy thermometer. Be careful not to let the mixture bubble over — turn down the heat if you need to, and keep a watchful eye over it. As the sugar is heating, prepare the egg whites. In the bowl of a freestanding electric mixer fitted with a whisk attachment, combine 2 large egg whites and 1/4 teaspoon cream of tartar. Start whipping the egg whites to soft peaks on medium speed. You want to have the egg whites whipped and ready to go when the sugar syrup reaches 240 (F) — if they're whipping faster than your syrup is coming to temperature, just stop the mixer until the syrup is ready. When the syrup reaches 240 (F), reduce the mixer speed to its lowest setting and slowly drizzle about 2 tablespoons of syrup into the egg whites to warm them. If you add too much syrup at once, the egg whites will scramble, so be sure to just add 2 tablespoons. Slowly drizzle the rest of the syrup, 1 to 2 tablespoons at a time — do not do more than that, or you'll have a sugar egg scramble and I'll cry for you! Once all the syrup has been added, increase the mixer speed to medium-high and whip until the marshmallow fluff is stiff and glossy, about 7 solid minutes and no less. Be patient — there are no shortcuts here. At 7 minutes, add 1 1/2 teaspoons pure vanilla extract and continue whipping on medium-high for another 2 minutes. Use the fluff immediately. That looks amazing, though when is fluff ever not amazing?! I *need* to know where you got those bears! 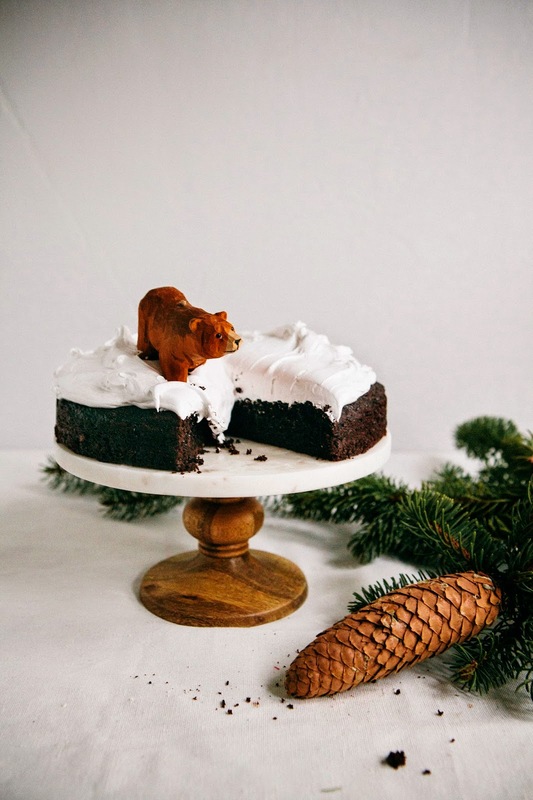 Seriously love the whimsical charm of this cake! Where did you get your bears figures? I want a pair too! 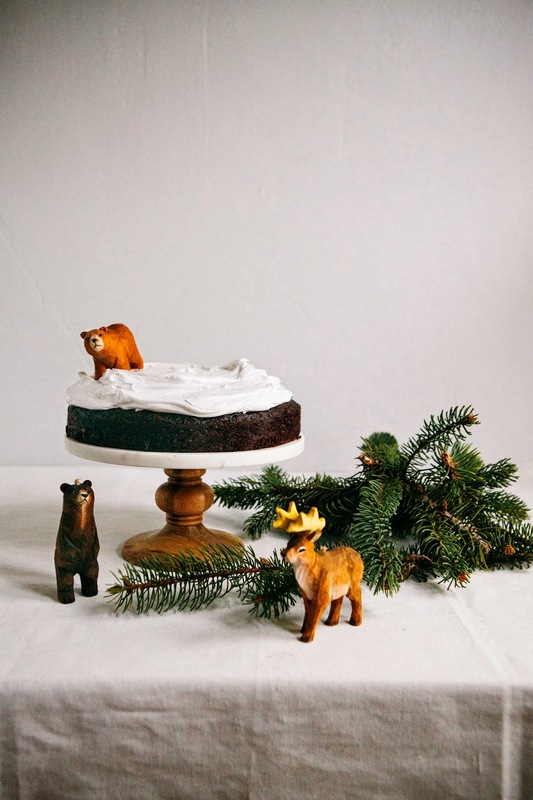 Hi Emily, the bears and the reindeer are actually Christmas ornaments (they come with twine string!!!) that I got from World Market (http://www.worldmarket.com/). They have so many adorable animals to choose from, it was hard to narrow it down to just those three! Hi Belinda, the bears are Christmas ornaments from World Market: http://www.worldmarket.com/ Thanks for stopping by, I love your blog! ohmygahhh stop all this cuteness, i'm having a cute attack. I LOVE IT!!!!!!!!!!!!!!! Use small 7-inch skillets and each person gets their own. It makes for a fun presentation. Just be sure to have enough pot holders and trivets so neither eater or table gets burned. We typically serve them with apple slices cooked with a bit of cinnamon and sugar. Is the cake good without the whipped cream? I searched through a lot of recipes in a hurry on Christmas Eve, trying to find a good way to turn frozen puff pastry dough into Christmas breakfast goodies since I had never used frozen dough. I ended up trying several approaches, and this was the best. The others gave me pastries that were too big, or too gooey. This smallish rectangle is the best! Thank you for offering this recipe - it's perfect! 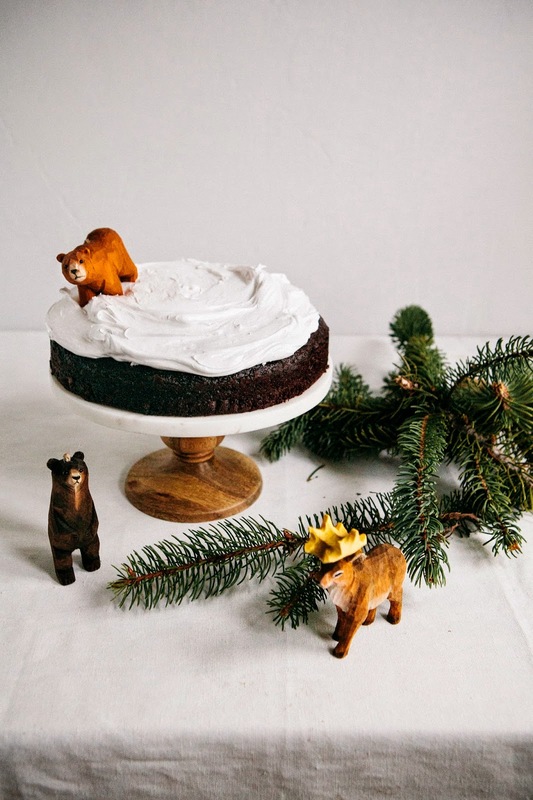 I love the idea of hot chocolate in cake form and those ornaments are adorable! This cake is going to have to happen soon at my house. The great thing about Portland is that if you want to go be in the snow it's just a short drive away. I just realized I haven't had a single cup of hot chocolate this winter. Not a single cup. I'm devastated but also super pumped cause I think I'm going to make this AND hot chocolate at the same damn time and double fist. Maybe I'll spike the hot chocolate with some bourbon...hmm... Beautiful work! I LOOOOVE THIS! The little animals, the marshmallow fluff snow!!! Perfection. Hope you had a wonderful holiday, Michelle!! Ahhh this is so great because my brother was just wondering if we could use all of our leftover hot cocoa mix for something and this looks SO GOOD. His eyes got huge--it's for sure bookmarked. Love the decorations on this cake so much!! The frosting looks super heavenly! 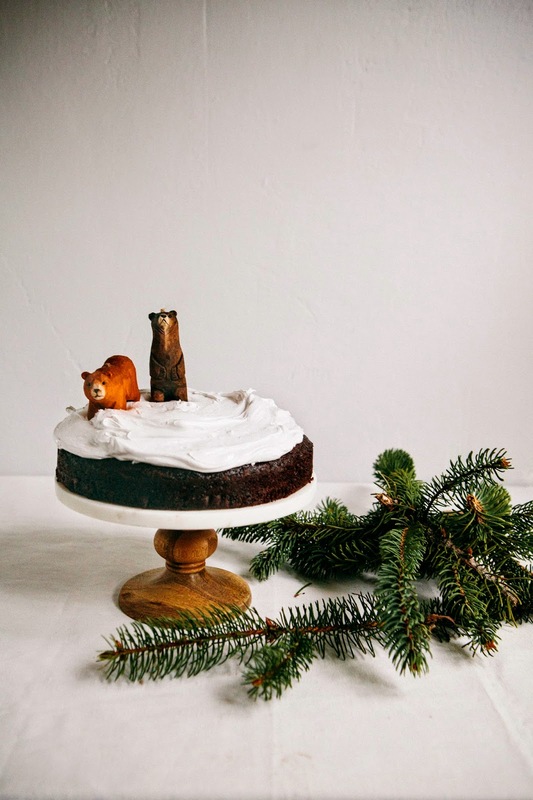 There must be some kind of award for world's cutest cake?! If not, there should be! I love this! 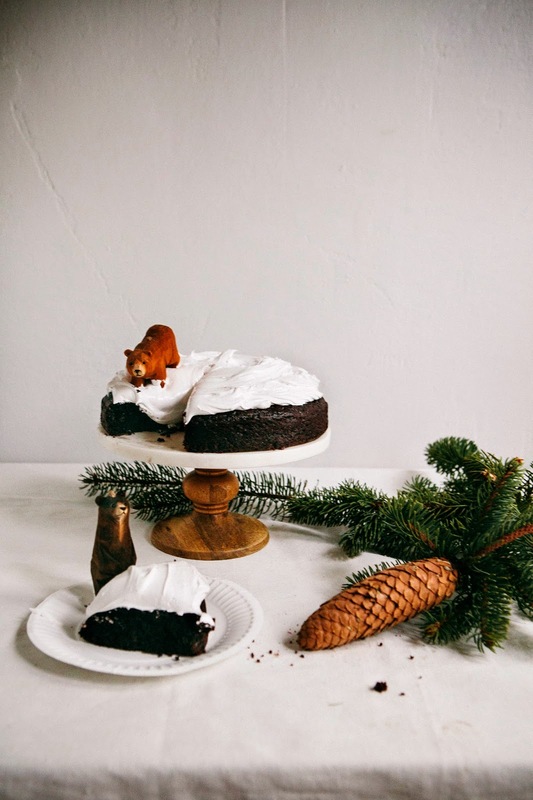 Beautiful cake & photos! 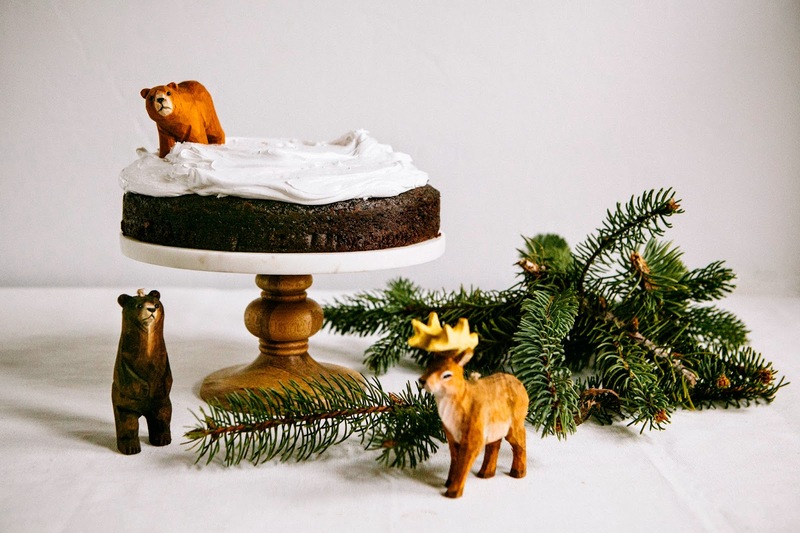 I love the animal ornaments as cake toppers - is it safe to put on top of the cake? i.e. their paint/coating won't affect the cake?